As the neo-conservative project finally dies in the USA, Tony Blair and his government are left stranded. The recognition that the war against Iraq is lost plus the overwhelming hostility of the US people to the war, shown in the electoral defeat for Bush in the midterm elections, has forced the US government to look for face-saving ways to get out of the mess it has created in Iraq. So Bush has subcontracted development of a new foreign policy to the Iraq Study Group, which among other ideas is considering talking to Syria and Iran to secure their cooperation for a solution. This has wrong-footed Blair, particularly after he and his MPs refused a Parliamentary demand for an inquiry into the invasion. In our 'democracy' it would appear that there is no way to hold this government accountable for its actions despite the overwhelming opposition to the war among British workers. "We'll see the job through." says Blair. "An inquiry at this stage would undermine our troops' morale," whilst another four British soldiers are killed by the resistance. British forces in southern Iraq are mainly confined to their bases, as it is unsafe to venture outside. Their vehicles are bombed if they use the roads, their helicopters are shot down if they travel by air, and now their boats are blown up if they travel by water. The local police have been taken over by Islamic militias. Even if the soldiers stay in their bases, they are killed by mortars fired into the base. Is this victory or defeat? No wonder army chiefs are demanding a withdrawal. Carne Ross, who was head of strategy for the UN mission in Kosovo, and played a leading role in devising policy on Iraq and Afghanistan, recently told MPs, "I think the presentation of intelligence to the public on weapons of mass destruction was manipulated and I think that the proper legal advice from the Foreign Office on the legality of the war was ignored." He added, "Policy making in the run up to the Iraq war was, I think, extremely poor in that I don't think the proper available alternatives to war were properly considered." On Iraq, he said the measure of success in foreign policy should be 'minimisation of suffering' and "if that is your measure, our policy has been a rank disaster in the last few years in terms of blood shed. By that measure that invasion has been a much greater disaster even than Suez." Since the invasion, 655,000 Iraqis, 2,855 US soldiers and 125 British soldiers have been killed (as of 16 November). Yet Blair tells parliament that the biggest threat to British troops would be an enquiry into how the government got them into this mess, and his docile Labour MPs support him. 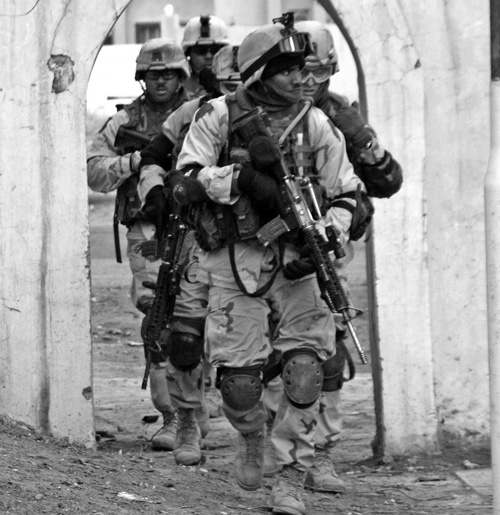 US troops in Iraq: overexposed, overnervous, and over there. The sectarian civil war, which he says will get worse if British troops leave, was created by the Anglo-US invaders. Having disbanded the Iraqi Army, they created a ramshackle new army, composed mainly of Iraqi Shias or Kurds, including the Kurdish Peshmerga who allied themselves to the US invaders. These 'troops' were then used to try to quell areas of resistance like Fallujah in mainly Sunni areas where those Sunnis who had joined the new army soon defected to the resistance. And so, in true colonial style, the occupiers set one group against another. They set up Shia death squads to assassinate resistance leaders and so it escalated to the scale of today. But the minute that James Baker of the Iraq Study Group mentions the possibility of talking to Iran and Syria to find a solution, Blair sends his loyal man Dennis MacShane to tell the Sunday papers for the first time that, "We must talk to Iran and Syria." Blair then addresses the Lord Mayor's banquet in London with a speech trailed in advance as saying the same. Having subcontracted British foreign policy to Bush, he now finds it being further subcontracted out to the Iraq Study Group and he has to try and keep up. But he couldn't quite find the words to invite Syria and Iran to join him in finding an exit strategy. He gave them a choice – "They can either be part of the problem or part of the solution..." "Iran must stop interfering in Iraq," he said, meaning "It's our colony so keep your nose out." "You must stop supporting terrorism and stop enriching uranium," he told Iran whilst preparing for a new generation of nuclear weapons to replace Trident. "You must stop supporting Hizbullah," he told them both, although he would not call for a ceasefire when Israel was pouring bombs on civilian areas of Lebanon. And perhaps his most laughable utterance, "You can either be partners for peace or face isolation". Isolation from whom, may we ask? Blair and Bush would say "isolation from the 'international community'". So just what is this so-called 'international community'? Well, you could argue that it's the United Nations. But the body of the UN General Assembly has consistently voted against aggression, colonialism, and in general against the foreign policies of the US, Britain and the EU. Perhaps it's the UN Security Council. But they did not support the invasion of Iraq. Maybe it's the permanent members of the Security Council who represent the victorious powers from World War II. But despite the collapse of the USSR and China's embrace of capitalism, they will not isolate Iran and Syria. After Hizbullah kidnapped two Israeli soldiers and Israel responded disproportionately by cluster bombing Lebanon, Israel's spokesman declared it had the support of the 'international community'. On this occasion, it turned out to be George W. Bush and his loyal follower Blair. Maybe the International Community is not Bush and Blair but the 118 developing nations attending the Non Aligned Movement's conference held earlier this year in Havana. They condemned any attacks on Iran, upheld Iran's right to develop peaceful technology and urged Israel to accept the nuclear Non Proliferation Treaty. Or maybe it's the 135 nations at the UN that elected Cuba to the Human Rights Commission when the US didn't even dare to stand. Or maybe the 182 nations who voted at the UN this year to condemn the US blockade of Cuba. Blair now stands naked with his credibility in the world at its lowest ever. In Britain, he is waiting for the bobby to knock on his door, asking him to help with police enquiries into the loans for peerages scandal. Historically, imperialism lashes out at home when it suffers defeat abroad. Now is a challenging moment for our trade union movement and our class when Blair is at his weakest.